Fun ideas for a Little Mermaid theme birthday party! Little Mermaid theme games, activities, party favor ideas, party food, icebreakers and more! Cut green streamers into varying lengths. Secure the bottom to the floor at the base of a wall, and give it a twist before securing it up onto the wall. This cool seaweed decor will make your party feel like it is underwater! Make some DIY jellyfish! Hang streamers from the bottom of paper lanterns. To hide the streamers, wrap an additional streamer around the base of the lantern. Put your jellyfish all over your party! Make a blue and white candy bar by putting different blue and white candies into decorative jars. Let guests take some of the candy home when they leave. Cut out circles from blue, white, purple, and teal pieces of paper. Sew these circles onto a thick piece of string for a fun garland to hang around the party. You can also do the same thing with balloons for an even bigger pop of color. Fill decorative jars with blue, white, and purple marbles or fish tank rocks to set around the party area. Blow up several balloons, and use a fishing net to hold them in. This can be put on a blank wall as a backdrop or on the ceiling for an interesting decor piece. Fill clear Christmas ornament balls with blue, teal, and/or purple glitter. Hang these around the party area. Buy wooden letters to spell your birthday kiddo’s name. Modpodge Little Mermaid scrapbook paper to the tops of the letters and hang up around the party. Fold a teal piece of paper in half and cut it to look like a clam. Open the invitation up and write all of the party information. 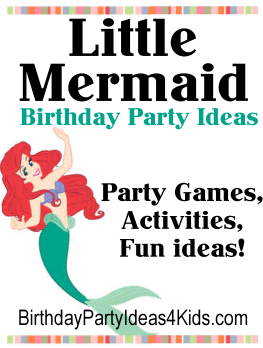 This is a fun Little Mermaid birthday party game to play with kids of all ages. Divide guests into two teams and give each team a sack or green pillowcase. One-by-one, have each member get inside of the sack and hop to a designated spot (about fifteen feet away) and back. When the member gets back, he/she hands the sack over to the next person who continues the relay. The first team to get all of their members back wins! Create a trivia game using quotes, information, and scenes from the movie. Blow up a picture of Ursula’s face and hang it around the party. Have the birthday kiddos throw water balloons at her face and see who can get the closest. You can also do the same thing with silly string. Fill a container with jellybeans and have each quest try to guess how many it contains. The guest who is the closest wins! Make sand art using under the sea sand art containers. Create a fishing booth using a blue tablecloth. Make fishing bowls using dowel rods, string, and small baskets. Purchase small toys to fill each person’s fishing basket with when they come to the fishing booth. Let the birthday guests decorate wooden treasure chests or clam shells. Provide paper, markers, paint, sequins, glitter, or anything else needed to make a beautiful masterpiece. Have each child write a message in a bottle. The message could be addressed to themselves or to the birthday child. Let guests string fake pearl beads onto string to make necklaces and bracelets. Before the party, use green tulle to make a long skirt (similar to a mermaid’s tail). Let each quest put on the skirt and take pictures. Serve food like goldfish crackers, spinach dip (‘seaweed dip’), cheese cubes cut in half (‘shark teeth’), and blue juice or punch (‘sea water’). Serve clam cookies! Take two sugar cookies (or two vanilla store-bought cookies) and fill with purple icing like a sandwich. Take a candy pearl and put it inside of the cookie sandwich so that it sticks out a little in the front. Cut watermelon and pineapple into star shapes. You can also do the same thing with PB and Jelly sandwiches. Mix Swedish fish into a jar of light and dark blue M&Ms. Roll white pieces of paper to make a cone. Fill these cones with cotton candy. Make white cakepops and dip them in blue sprinkles. Dye white chocolate blue or purple and dip giant marshmallows in it. For party favors, give out small bottles of bubbles, bags of goldfish, swimming goggles, pencils, and stickers. You could also do bubble wands instead of the bottles of bubbles. Use colored sand pails as goody bags. Glue blue stripes onto yellow gift bags to make goody bags that look like Flounder! Have a family member or friend dress up like Ariel and make a surprise appearance.